Artists impression of the sky deck in Queen's Wharf. Concept images only. Subject to approvals. 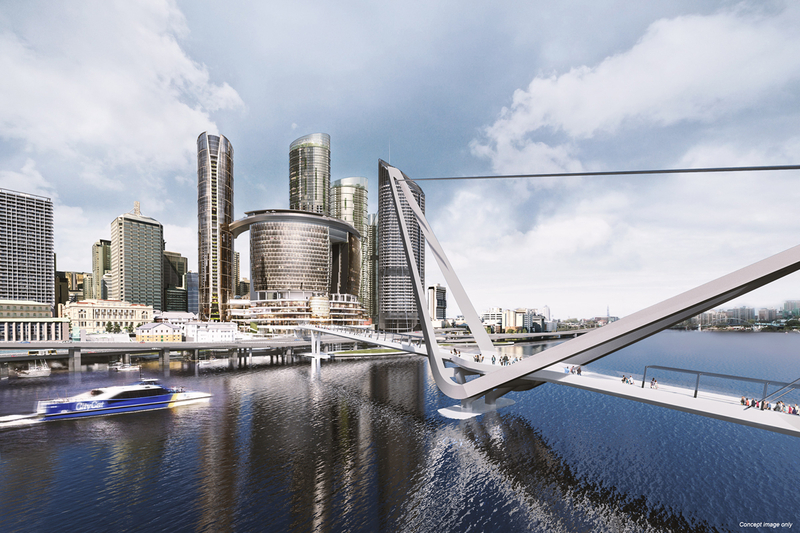 The new pedestrian bridge, designed by Grimshaw architects, will enhance connectivity between the CBD and South Bank. Concept images only. Subject to approvals. Destination Brisbane Consortium’s projections outline an annual increase of $1.69 billion in Queensland’s tourism spend. Concept images only. Subject to approvals. The Queen's Wharf development in Brisbane is still in its early stages, with Probuild currently working on the basement excavation and shoring work, expected to be finished in late 2019 when the site will be ready for foundations. In another part of the site, Multiplex is working on the construction of Waterline Park and the Goodwill Extension area upgrade that will see the transformation of a 500 metres stretch of the Bicentennial Bikeway from the Goodwill Bridge to the area behind 1 William Street, according to Destination Brisbane Consortium, the company delivering the Queen's Wharf Brisbane integreated resort development. It will also include construction of a 450 metre walkway above the Brisbane River. Waterline Park and the Goodwill Extension area upgrade work is expected to be completed by late-2019. WILLIAMS MEDIA spoke to Destination Brisbane Consortium, Brett Fraser CEO of Brisbane Marketing, and Haesley Cush owner and auctioneer at Ray White New Farm, about what is still to come and how Queen's Wharf will make a difference to Brisbane. 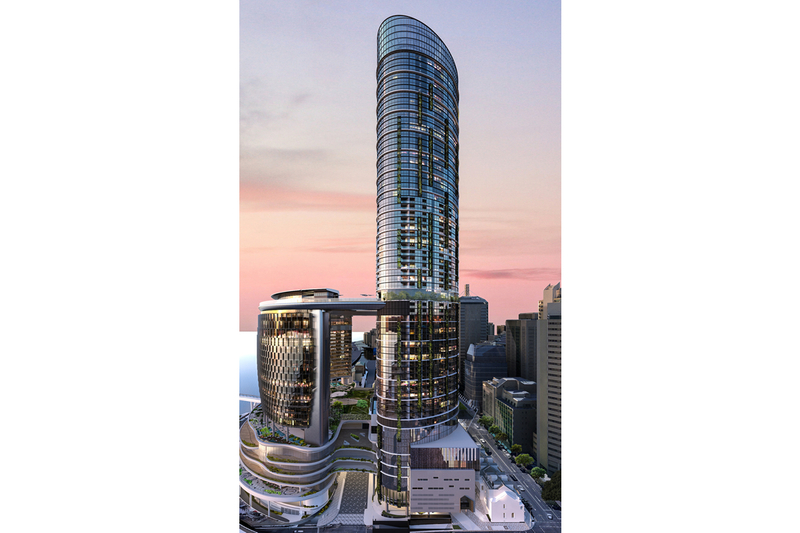 According to Destination Brisbane Consortium, the first part of Queen's Wharf is set to open to the public in 2019. A section of the public realm between the Goodwill Bridge and behind 1 William St will become an upgraded bikeway, recreational park and pedestrian river walk with Indigenous interpretive story-telling called the Mangrove Walk. Destination Brisbane Consortium told WILLIAMS MEDIA when Queen’s Wharf Brisbane Integrated Resort Development opens in 2022 it will transform Brisbane with a diverse mix of new riverfront space; high quality dining options to suit every taste and budget; exciting nightlife and entertainment; local and international retail brands; and world-class five and six-star hotels. “The project will revitalise a tired and underutilised part of the city,” said Destination Brisbane Consortium. “The Integrated Resort Development and majority of public realm will open in 2022, with focus then directed to the Treasury and Land and Administration Building’s that surround Queens Garden, which is expected to be repurposed and open in 2024. Queen's Wharf will include revitalised heritage buildings, which in recent years have been off limits to the general public. “Queen’s Wharf Brisbane is recognised as the birthplace of Brisbane’s European history, and it has one of the greatest collections of culturally significant buildings and places in Australia, dating back to the early 1800s”. “As part of our multi-billion dollar development, all the heritage buildings in the precinct will be repurposed and reactivated for public use,” said Destination Brisbane Consortium. “By sensitively revitalising these ‘jewels’ of the precinct, locals and visitors alike will have the unique chance to explore European history of Brisbane through a variety of food and beverage, tourism and retail experiences, which will breathe new life into a largely underutilised part of the city. Destination Brisbane Consortium said of the nine heritage buildings, the Commissariat Store will remain the home of the Royal Historical Society of Queensland and the Museum of Queensland and Convict History. Meanwhile, a range of offerings within the development will also pay homage to the site’s Indigenous past, ensuring the Aboriginal history of the precinct features prominently. Brisbane will acquire a new pedestrian bridge, the Neville Bonner Bridge, which will cross the river from the retail, food and beverage level of the resort to the cultural forecourt at South Bank, near the Wheel of Brisbane. The new pedestrian bridge, designed by Grimshaw architects, will enhance connectivity between the CBD and South Bank. “Queen’s Wharf will provide enhanced pedestrian travel to and from South Bank, with the new pedestrian bridge. “The Neville Bonner Bridge has been strategically positioned to connect the CBD and QWB to South Bank rail and bus stations,” said Destination Brisbane Consortium. Transport options will also include an upgraded cycleway along almost 1km of riverfront. Throughout the precinct there will also be improved pedestrian options including Queen’s Wharf Road and laneway spaces. “When it is expected to open in 2022, it will provide pedestrian connectivity throughout the precinct, as well as to train and bus services within the CBD network and to the Cross River Rail station on nearby Albert St.
Related reading: Brisbane's Future Blueprint reactions are "basic human nature"
“A 5-level basement is also being constructed to include more than 2000 car parks." Brett Fraser, CEO of Brisbane Marketing told WILLIAMS MEDIA “Having the right investment in tourism infrastructure, such as the Queen’s Wharf project, is essential to cater for the ever-evolving needs of visitors. “Destination Brisbane Consortium’s projections outline an annual increase of $1.69 billion in Queensland’s tourism spend, and a projected 1.39 million additional tourists per annum, which will have an enormous ripple effect across a range of sectors. “This $3.6 billion development is one of $12 billion worth of new tourism-related infrastructure projects underway including Howard Smith Wharves, the Brisbane Quarter, the International Cruise Terminal, Brisbane Airport’s parallel runway and more. Haesley Cush, owner and auctioneer at Ray White New Farm believes Queen's Wharf is a significant game changer for Brisbane. He told WILLIAMS MEDIA in his opinion there are three major elements that are going to be heavily impacted by the development. “The first and most inconsequential - it will mature our city beyond that of a big/small city or small/big city. Related reading: Howard Smith Wharves "game changing for Brisbane"
“It will be the first step towards Brisbane really becoming an international city. Mr Cush said the second element is Brisbane will change from a stopover to a destination. “Because Brisbane is the closest capital to Asia on the East Coast, it will allow the Asian community to come down and take advantage of the casino. “Other family members who don’t want the casino can go to the Sunshine and Gold Coasts and other attractions such as Australia Zoo, and take advantage of fairly consistent weather conditions. Mr Cush said the Eagle Street precinct and South Bank will benefit as the local market will venture out and support them in the traditionally less busy Sunday to Wednesday period. “The third element is it will lead to more jobs, and there is an abundance of apartments in inner city Brisbane, where those workers will want to live as they will be close to work. “They will take advantage of that accomodation and competition in the rental market, prices will rise for those apartments, and investors will get a better yield. “All the apartments we’ve complained about in the last few years will likely fill up, whether it is from short term or long term accommodation,” Mr Cush continued. Click here for more information on the Queen's Wharf development.